I’m really eager and excited to be outside in my garden, getting to work on my flower beds. Perhaps if I had my own garden conservatory or sunroom, I wouldn’t feel quite as stifled by this long, drawn-out winter. Hi, everyone! I hope you’re all doing well…it’s just barely starting to act like spring outside, here in the Northeast United States. So I’m really eager and excited to be outside in my garden, getting to work on my flower beds. Perhaps if I had my own garden conservatory or sunroom, I wouldn’t feel quite as stifled by this long, drawn-out winter. One of my lovely clients is super fortunate to have just such a large, fabulous, window-filled conservatory off her kitchen, and I’ve been happy to help out with some updates this winter. Originally, my client had some quaint, but small, vintage iron furniture in the room and it just felt a little dwarfed in the expansive space with its wonderful tall ceilings. Plus the leggi-ness of the furniture (yes, that is a technical term! LOL) and the floral print on the cushions created quite a bit of visual clutter. BEFORE: Bold green on the walls, salmon on the tile floor, and a soft turquoise on the tray ceiling are vibrant and exciting in this conservatory, but the vintage iron furniture is leggy and small, while the striped rug is undersized and not relevant to the furniture placement. The fabrics feel old-fashioned as well. Now it’s time to work some visual magic, making the bold color scheme work for her space. This client is fearless about choosing color (I love that! 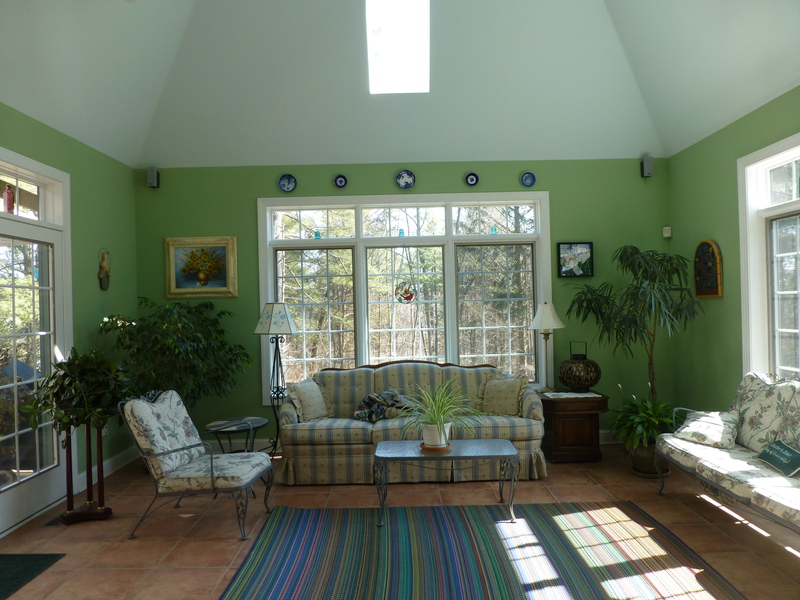 ), she had selected an energetic green for the walls as an extension of all the beautiful color visible outside the windows. This necessitated choosing a neutral sofa to break up all that color. We also wanted something chunky and large, to anchor the space visually and, of course, add comfort for lounging in the awesome sunlight which streams through all those amazing windows. 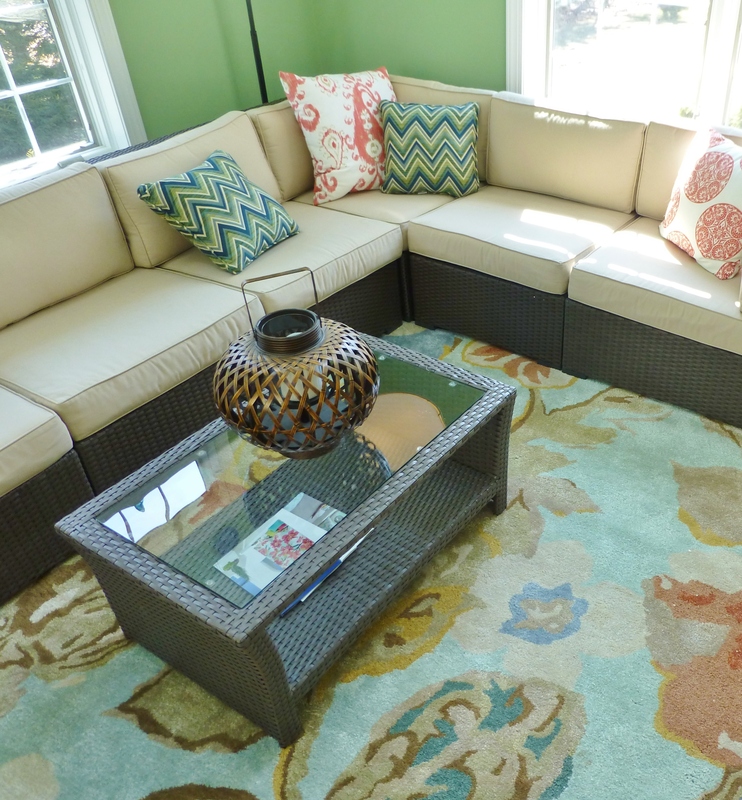 AFTER: the large sectional with neutral cushions anchors the space and breaks up all the bold color. Scale is so important in a large room like this one. 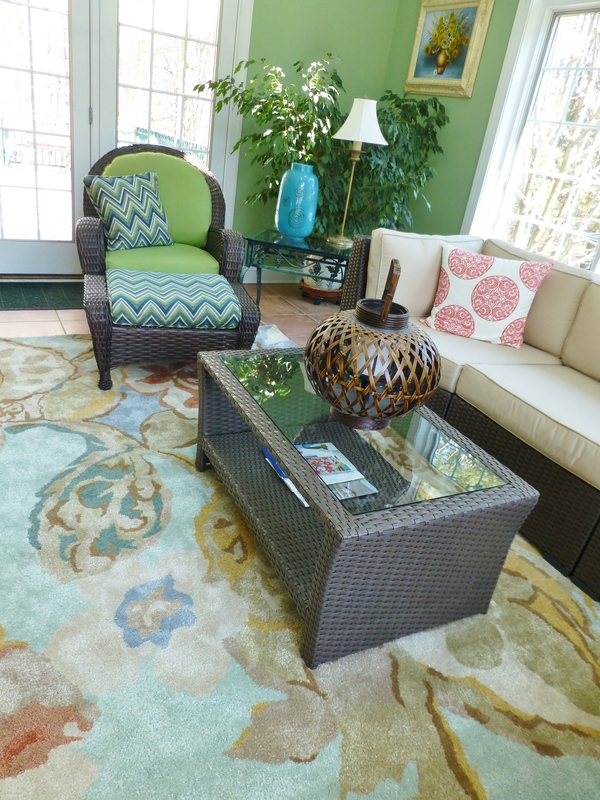 A large, contemporary wool area rug anchors the seating area and adds to the color story. A tall arc lamp provides nighttime reading light and anchors this corner of the sectional. 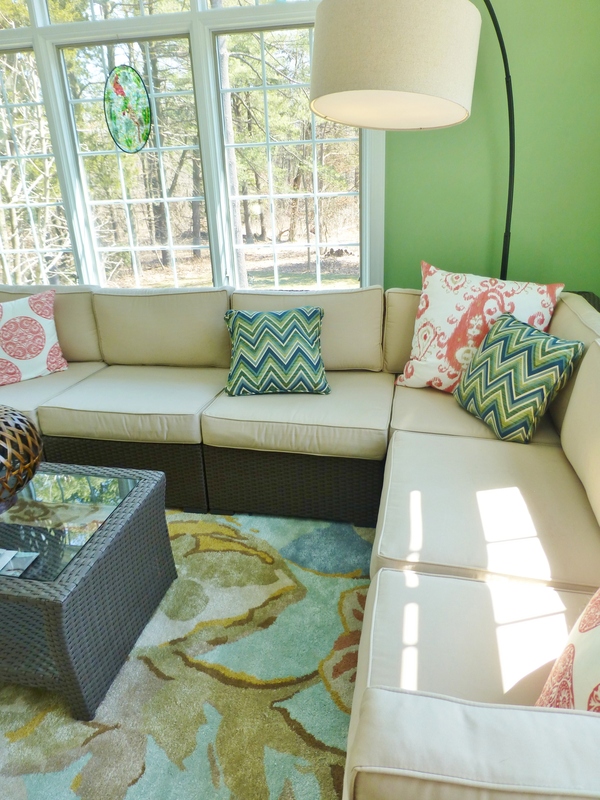 Colorful pillows scattered throughout, add pattern and provide pops of color on the neutral sectional cushions. The artful wool rug provides soft comfort underfoot, while acting like artwork in the large space. Colors in the 8’x10′ rug unite the whole room while the softer, muted color palette helps tame the vibrant green walls. A comfortable chair and ottoman provide another spot to relax and take in the outdoor views, in this fresh vivid space. I think after making these additions to the conservatory this would be a cheerful and energizing place to enjoy morning coffee all year long. The changes my client and I made to this room, have really enhanced and improved her space, don’t you think? Thanks for joining me, once again. Until next time, please tell everyone you know about Kristine Robinson’s blog. Feel free to pin these images on Pinterest, or share on Facebook. I love making new friends! 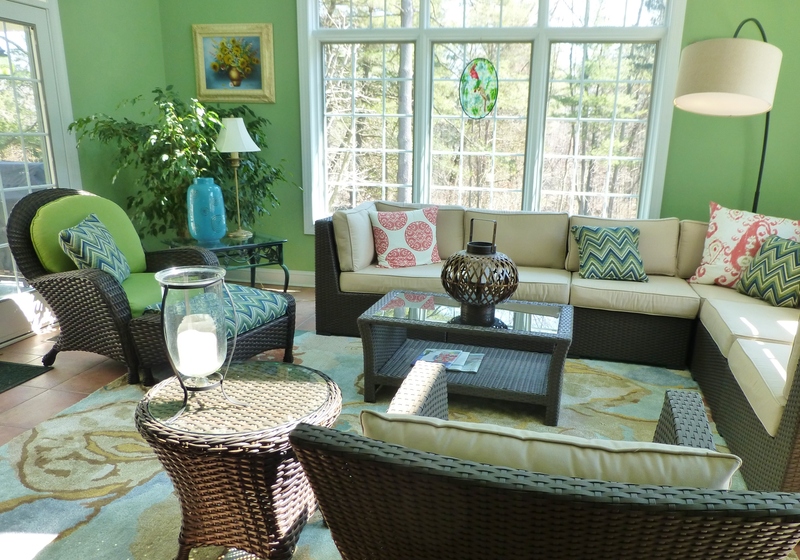 This entry was posted in Choosing Color, Color, Furniture, Interior Design & Decorating, Robinson Interiors and tagged Arc Lamp, Area Rug, Conservatory, Furniture Scale, Green, Kristine Robinson, Sectional, Sunroom, Terra Cotta Tile, Turquoise, Wicker Chair, Wicker Sectional. Bookmark the permalink.